Forum | PolishOrigins :: View topic - Sending Christmas gifts to Poland. Sending Christmas gifts to Poland. Posted: Sat Nov 22, 2014 4:31 pm	Post subject: Sending Christmas gifts to Poland. What are some good ideas for sending Christmas gifts to Poland? What types of gifts would relatives in Poland really appreciate? You can check the online USPS calculator to give you an idea of the size packages that are acceptable and it will give you an estimate of the cost for sending a package. Shipping is expensive and you can almost count on the fact that you will spend twice as much for the shipping as what your item inside the package cost you. The last item I sent to Greece was a relatively thin hardcover book that fit in a padded envelope. The Book cost $15 to buy and the shipping was $18.50 sent regular delivery. In the 1970's- mid 1990's, I used to send large boxes of used clothing items, medicines and toothpaste, fabric and light weight toys & candy that could not be purchased in the stores at that time, during the communist rule. I was sending the packages to a family with 11 children and they were in need of assistance. Back then, it cost about $2.50 for the first few pounds and then much less per pound after. I would send 2-3 boxes at a time that weighed at least 30 pounds. I did not consider the cost to me as I knew the family was much in need of the items. They could not even buy aspirin or Muscle Rubs & vitamins at that time. These packages were sent by Ship and could take up to 3 months to arrive, then they went through Customs and due to the political sysyem, I was told that not all items may arrive at their destination as they were often taken from the packages. Times are different now, as they Do have access to goods on their shelves, however many of the items I have been told are costly due to excessive taxes. And I have been told that their health care system is such that appointments are made for dates far in the future and if one is in need of earlier medical service they must then pay "out of Pocket". So Cash is very helpful in the current conditions, I have been told. Even though they will have to pay a bit to "Exchange" our dollars for Zloty, they can choose items that are most helpful to their needs. However if it is a single older person, I think a sweater, shirt, blouse, socks, handkerchiefs, Holy pictures, and Family Photos and a treat of tea, coffee or candy is good. If sending Photos, be sure to write full names and even relationships & your full address on the back of the photo. Then in the future, that photo will end up in the hands of other possible relatives and they will have your contact information! As many of us have experienced in our research, many families in Poland do not have many if any family photos, so I believe in changing that situation by Us sending small photo albums to them to give them that connection. None of my Polish relatives have had old photos of the relatives that emigrated to the USA. They had stories and knew the names and relationships. I was the one that provided them with the photos that I was hoping they could provided to me! By doing this we change the whole situation as they hold our little photo albums they now have a concrete item in their hands to remember us by and to pass down their line. The drug store or discount store sells a 4 inch X 6 inch size light weight vinyl/ plastic album for $2.00 or less on sale and it holds at least 20 photos. I ordered many reprints from my genealogy photo file from Costco at a good price and assembled the albums. I would suggest that you think about what the "needs" of the person/family. Then always consider the weight of the items. To cut down weight, perhaps even remove outer packaging if it is not needed and just wrap it nicely in pretty tissue paper and a ribbon if presentation is desired. Gifts are very difficult question, and today you can buy everything everywhere in Poland, it's only a matter of cash (and transportation if an eldery person is living in a countryside). The idea of posting pictures seems interesting to me, but I wanted to know if you may print a private book or photo-album in Poland, and buy a delivery to N different adresses. The best thing: ask young people if that is possible, so I did. The biggest and the best Polish bookstore is Empik. Well, actually it was a bookstore, like Amazon, but now it sells zillion things, like Amazon. They are in many places in Poland, and it is worth to know that the delivery to their point of presence is always free of charge. The cost for 28 pages, very good quality paper, 20x30 cm, solid cover, is 50 zl (full price) and a little less when they have special offer. Less than US $20. You may pay with your credit card, with a delivery in Poland (Poland to Poland postal service shippement, no international). Another option is to prepare a PDF, and send it as attachement to your Polish family. They may print it in any of printing points, at very reasonable cost. NB. I want to streess out that I did not practice Empik by myself yet. You can send packages the Cheapest way through POLAMER. I sent a box weighing 35 lbs. for around $24. They now have Polamer ONLINE so you can send packages directly to Polamer from anywhere in the US. I hate paying post office but if your lucky you can go to one of Polamer's locations. I just learned that now you can also have relatives in Poland shop on ebay and have it shipped directly to Polamer where they will ship it to Poland!! Nice present to get what they really want. We all love shopping on e-bay especially with many who have free shipping. Then you could skip the post office! I have used Polamer for the past 7 years (every Christmas) and have never had any problems. I think they are Fantastic! Their website is in English and Polish, just select language preference at the top of the page. They will also help you over the phone. Very friendly, very efficient business, VERY CHEAP SHIPPING! Post Office is fine for envelope sized gifts, but nothing else. Polamer ships by the container full and that's why it's inexpensive. They also will ship by air, but I've not gone that way. By Sea usually takes 4-6 weeks depending on the season. Your package will also have a tracking number so you will know when it is received. Best gifts: Levi Jeans cost $75. US in Poland... they never wear out and are luxury for them. Nike shoes are even more expensive. I plan on trying the e-bay shopping spree this year. All you have to do is give them a monetary limit. How fun for them to shop! I've been trying to order books from Empik.com for my Polish cousin. But they haven't been taking my orders. Maybe because I'm in the USA and my cousin is in Poland? I called my debit card and they're accepting the orders on their side. So it must be something on the Empik side. But there's no way to call Empik. Any tips on how to get my orders accepted? I do not have any practice with Empik (or any other shop online in Poland). It is a little specific, because you can order things without payment in advance - paid on reception - and people use it often. At which stage is your order refused? I noted that you must register first, before being able to make an order. Was your order refused at this stage? They provide the telephone land line number in the bottom, in Warsaw. I called my debit card and they're accepting the orders on their side. So it must be something on the Empik side. But there's no way to call Empik. Any tips on how to get my orders accepted????? Im not sure if paying by card is right when ordering from outside Poland. - dane odbiorcy, kwotę i numer zamówienia dokładnie przepisz z blankietu. - kwota bezwzględnie musi być wyrażona w PLN, nawet jeżeli Twój rachunek jest prowadzony w innej walucie. - numer rachunku, na który wpłacisz środki należy podać w formacie IBAN, tj. PL 10 1060 0076 0000 3300 0058 7811. - jeżeli bank tego wymaga, podaj kod SWIFT: BPHKPLPK. - wybierz opcję kosztów OUR (koszt przelewu w całości ponosi nadawca). Aby płatność się powiodła muszą zostać spełnione wszystkie powyższe warunki. Przykładowo, jeśli określisz kwotę w walucie EUR lub wybierzesz opcję kosztów SHA, płatność nie zostanie rozliczona. Generally speaking this is only info with word "abroad'. This would meant its right way to pay from abroad by bank transfer in PLN currency. What you quote is a wire transfer, which means the most costly from outside European Union, you have plenty of opportunities to make mistake, as we do not speak the same bank-slang on two sides of Atlantic Ocean. But Empik does accept usual credit cards (Visa, Master, probably American, ...) and PayPal. Select what you want to buy (I took a book in my test). Put it in your basket. Click on basket to pay. 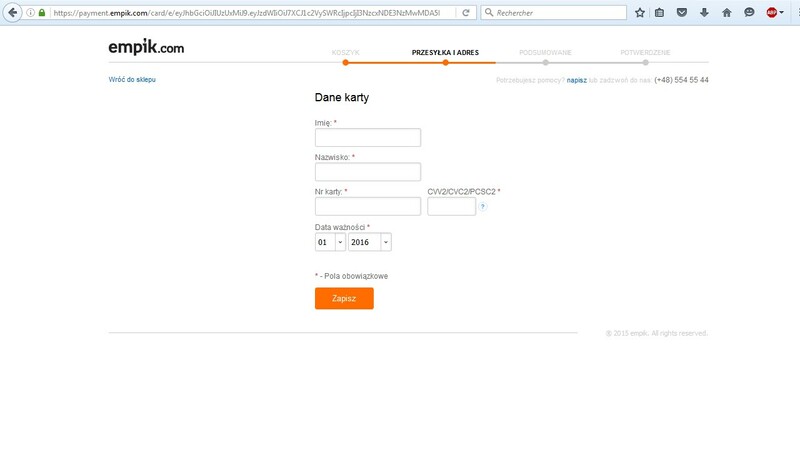 You shall open an account - that means email, and you billing address (you can order without account, but it is more complicated - because the verification that you are human is in Polish, and you must click on correct picture answering a question in Polish; I was asked to clik on zarowka. And in any case you will have to enter your billing address.). You must chose delivery method, and provide correct postal address in Poland and zip code - after my correct zip code in Warsaw, the name Warszawa was automaticaly written, so it might be you will have the same magic for any village name with plenty of diacritic marks. You must select payment method - assume you want Visa, that is easy, even in Polish as in attachement. The debit card is very much US specific. I do not know anyone using it in France, and the concept is very difficult to understand. There are some strings attached to debit cards. Each time I am in the US, and have to answer credit or debit card, I am confused. It did happen I answered by mistake "debit card", and it was not working. So they know how to recognize it. It is probably similar in your case, use your credit card, or PayPal, and it will work.